Almost everybody already knows that the quite famous Tetroid has created new interfaces and boards, even cloning (and to a certain extent improving) the milestone “mother of all expansions”: the Super Gold Card. On the wave of this big boost, recently in the international Forum (www.qlforum.co.uk) we’ve already seen the rise of hypotheses about a worthy successor to this excellent board. Between words and deeds there is surely a big gap; anyway this need exists, and in this case it’s not about mere fantasy, but by now feasible hypotheses. some decent sound (AY chip or other). Some argue that there is already the Q68, and in a sense it’s true. The Q68 is a great stand-alone machine, compact and with great potential. Nevertheless here it’s about something quite different, in the sense that what is really lacking seems to be something radically new for the QL. By the way, it’s ongoing the assessment of the feasibility of a simple kit (for which a first scheme has already been proposed) to enable the insertion of Q68 into a QL, replacing the motherboard. This would be to the advantage of all those who prefer to maintain a certain design and retro emotions. The only quite difficult aspect would be the keyboard management. So, also this project apparently supports the need for something which is not external but that can be placed into the QL case. Someone pointed out that the only flaw in this project are the Q68 speed restrictions, and this should not be underestimated; indeed also this is being discussed. Several concrete approaches, also quite cheap and feasible, have been proposed in order to make real this (if I may use that term) “Hyper-Goldcard2”; each one has its pros and cons, and the discussion has been quite vibrant. The need for a brand new motherboard is real, but for the moment the expansion board option seems more attractive/feasible. 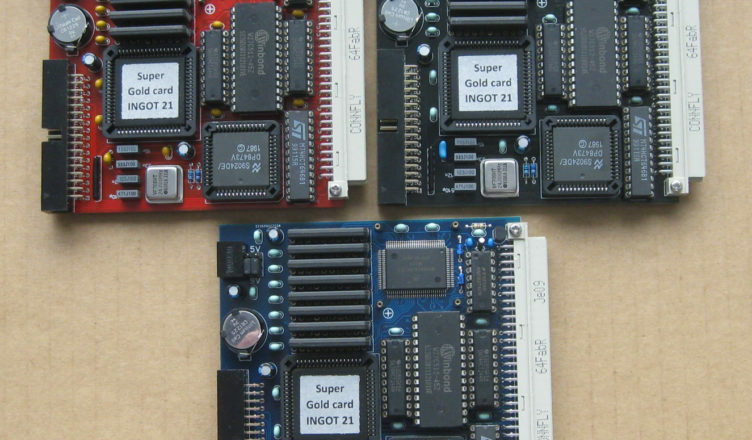 Also some well-experienced and fully satisfied Q68 owner thinks that what is truly needed is indeed an expansion board like Super Goldcard, but it would be crucial to have a fair, reliable and simple video port, that’s finally standard. And some extra color would be very nice. The dialog proceeded with remarks made by Nasta and other “gurus”; then the topics became more and more technical and complex. For anyone who wants to deepen, I suggest to refer to the Forum directly. Such new ideas can only benefit the QL scene. Naturally, there’s no assurance this project will become real; but since overall the discussion has been vibrant from the beginning, and remarks made by various “gurus” have been frequent, I think we can say that the preconditions are positive. At QLheaven see this post. A QL keyboard matrix to USB adapter has been used to make a QL case in to a keyboard for a RPi.